Often when we hear of zero waste movements, or civic and corporate zero waste commitments, they are actually "zero waste to landfill" campaigns. They're not aiming for zero waste to be produced, just for all waste to be managed somehow – usually, relying heavily on recycling. In fact most of us have probably said, or at least heard, the statement: "It's not waste – it gets recycled!" or for food, "it goes to compost!" Certainly it's old news to the waste recovery industry that one person's trash is another's treasure. High-quality, well-sorted waste isn't just usable, it's desirable – either for recycling or conversion into fuel. The Australian recycling industry is doing a good job of repurposing most of our collected recyclable material. This contributes to developing circular economy, in which recycled waste displaces virgin material in production. But, like many words, there's a crucial difference between the common and technical definition of waste. Conversationally, "waste" is understood as something unwanted or unusable, that has no value. In technical terms, it's a classification of a resource or product at a certain point in its value chain. It might seem like a pedantic distinction. But language shapes our understanding and behaviour, and our conception of what is possible and important. Albert Shamess, Vancouver's director of waste management said recently, "we can't recycle our way to zero waste". It goes to the heart of the question: is waste still waste if it gets recycled? The standard waste hierarchy generally demarcates between waste avoidance and waste management, with recycling squarely in the waste management zone. In this sense, recycling is something we do to waste, not a way to avoid it. These days, recycling is standard practice in most Australian households and in general is fairly simple. It's not that hard to place an item in a recycling bin instead of the rubbish when they're side by side in the kitchen (or in an office, or public space). But recycling sits fairly low down the waste hierarchy. When we say "it's not waste if it gets recycled", it makes it easier to avoid more important actions with greater potential impact. Similarly, when zero waste commitments are defined as "not going to landfill", it's too easy for companies or cities to set a diversion target and focus on recycling and recovery, rather than setting targets for the more complicated task of waste minimisation. But while recycling (and recovery) is a great last line of defence, it's nowhere near as effective as avoiding the waste in the first place. Why is recycling low on the waste hierarchy? The waste hierarchy prioritises actions based on how much they benefit the environment. Recycling is certainly magnitudes better than landfill, because it replaces virgin materials in the manufacturing process. For example, recycling aluminium is 95% more efficient than using virgin aluminium, recycling plastic is 85% more efficient, paper 50%, and glass 40%. But the recycling process still consumes energy (and other resources), and costs money. 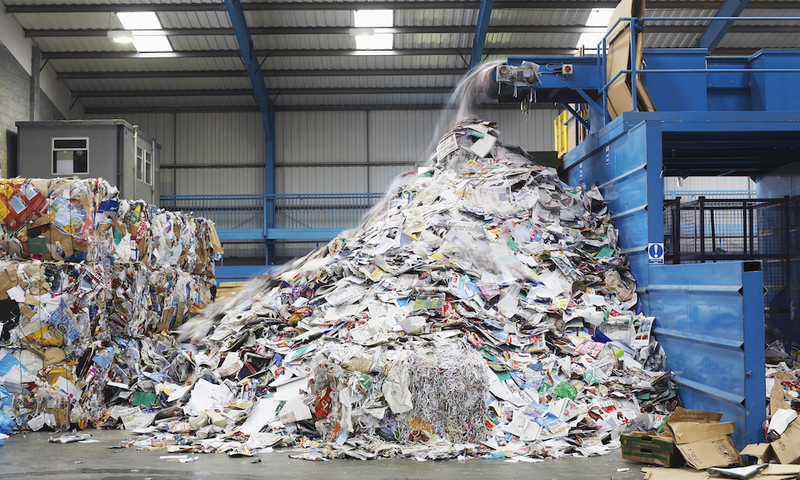 And for many materials, particularly plastic and to some extent paper, recycling is also a downgrading process. These materials can only be recycled a certain number of times before they degrade beyond all use, and generally then end up in landfill. At this point, they can't be recovered for waste to energy. On the other hand, if we could reduce the amount of material that needs to be recycled, or better yet, the amount that needs to be produced in the first place, these costs would disappear altogether. Better consumer choices can play a role, but more significant are improved resource management and smarter product design. In our transition to a circular economy, the way we characterise things may shift to emphasise the that objects have value beyond the end of their intended life. But it's essential we still call a spade a spade. Regardless of whether something is "waste" if it gets recycled, recycling (and recovery) needs to be seen as what is is – a last line of defence. Minimising waste is more important than managing it, and we need to keep our focus there.